Mumbai, aka Bombay, is a wonderful addition to a tour of Rajasthan. Not only is it an ideal destination to start or end your cultural immersion, it can also be a great connecting point for those who’d like to explore both the north and south of India (direct flights are available from Jaipur, Jodhpur and Udaipur). The home of Bollywood has always had style. A port city overlooking the Arabian Sea, it’s famous for its huge population (over 16 million people and counting), its glittering film industry, its skilled dhabba-wallahs (tiffin carriers), and the extremes of wealth and poverty. Fashionable Mumbai swirls around Colaba, and bars, restaurants, shops, movies, parties and festivals are everywhere: this is a city that never sleeps, and why its affectionately referred to as the ‘Maximum City’. Two nights would be a sensible amount of time to soak up the flavour of Mumbai. For those with more flexible schedules or who appreciate a relaxed pace, three nights would be preferable. With a two night stay, we would typically suggest a full day of sightseeing, accompanied by one of our passionate and experienced guides. You’d also have your own private car and chauffeur to whizz you around Bombay. What is there to see in Mumbai? We’d recommend starting your day early, at the bustling markets. The eclecticticism and industrious nature of Mumbaikers is what contributes to the unique culture of the city and, when observed in the early morning, is quite exhilarating! Exploring Mumbai by dawn allows you to experience the bustling city wake up. Hundreds of newspaper vendors sort out papers in multiple languages, auctioneers frantically gabble fish prices, a herb market sprawls across a bridge, and organised chaos breaks out with the arrival of over 100 tonnes of vegetables, fruits and meat at the markets. The scenes at dawn truly define the mercurial character of Mumbai and, best of all, as you walk the same lanes a few hours later, you find no evidence of the morning’s hustle. After returning to the hotel for breakfast and a quick freshen up, you’ll continue exploring Bombay at Mahalaxmi Dhobi Ghat. This 140-year-old dhobi ghat (a place where clothes are washed), is Mumbai’s biggest human-powered washing machine: every day hundreds of people beat the dirt out of thousands of Mumbaiker’s clothes and linen in 1026 open-air troughs. Your guide will recommend stopping on the bridge from across the railway tracks, as this spot offers the best view. To really take in the extreme contrasts of Mumbai, you may like to take a tour of Dharavi – Asia’s largest slum. Conjuring up images of Danny Boyle’s Slumdog Millionaire, Dharavi is a colossal jumble of homes and businesses. Following your knowledgeable guide through the narrow alleyways, you’ll be introduced to local residents and their small-scale industries – recycling, ceramics, embroidery, soap making, and more – all manufactured by innovative means. Mumbai’s most famous landmark, the Gateway of India, was the first sight to greet travellers to Indian shores during the heyday of the British Raj. Ironically, it also became the exit point for British troops after India gained independence in 1947. It was built to commemorate the visit of King George V and Queen Mary in 1911, en-route to the Delhi Durbar, but in fact, the King and Queen were met with a mock cardboard structure – the actual monument was completed only in 1924, years after the royal visit! Renowned for its superb sculptures and miniature paintings, the Prince of Wales Museum is housed in a grand Indo Saracenic building designed by George Wittet. Its founded stone was laid by the Prince of Wales (the future George V) in 1905. During World War I, it served as a military hospital. Generous gifts from discerning private collectors have enabled the museum to build a collection of rare quality. Other sights you’ll take in include Victoria Terminus – one of the world’s most spectacular railway stations, Horniman Circle, Flora Fountain and the High Court. You may also like to visit Mani Bhavan – the building where Mahatma Gandhi ji stayed during his visits to Bombay from 1917 to 1934. Exhibitions include a photographic record of his life, along with dioramas and documents, such as letters he wrote to Adolf Hitler and Franklin D Roosevelt and tributes from Ho Chi Minh and Einstein. To end the day, Marine Drive makes an ideal evening escape, and you’ll be joined by hundreds of other people strolling by the sea. On your way there, you can stop to visit the Hanging Gardens and Jain temple. Built on reclaimed land in 1920, Marine Drive arcs along the shore of the Arabian Sea from Nariman Point, past Chowpatty, and continues to the foot of Malabar Hill. Lined with flaking art deco apartments, it’s one of Mumbai’s most popular promenades and sunset-watching spots. Its twinkling night-time lights earned it the nickname ‘the Queen’s Necklace’. Hundreds gather here in the early evening to snack and chat. If you’re a foodie, we’d recommend dining at the Taj Mahal Palace this evening. This landmark hotel is situated on the waterfront in downtown Mumbai, facing the Gateway of India you visited earlier today. Built in 1903, it’s a Victorian extravaganza which has been sensitively refurbished to maintain its character as Bombay’s ‘grand dame’. Excellent restaurants and a choice of lively bars can be found throughout the hotel, which remains an institution. We recommend their Masala Kraft restaurant – serene with vaulted ceilings, the restaurant serves modern cuisine from all over Indian and is known for its artistic presentations. On our recent visit, we ordered the Sketch, which includes nine vegetarian dishes on ceramic plates of different sizes. Standouts include the char-grilled broccoli florets with Indian mustard and pickling spices, and the potatoes in a spicy blend of cumin, chillies and curry leaves. We’d recommend the Oberoi Mumbai. 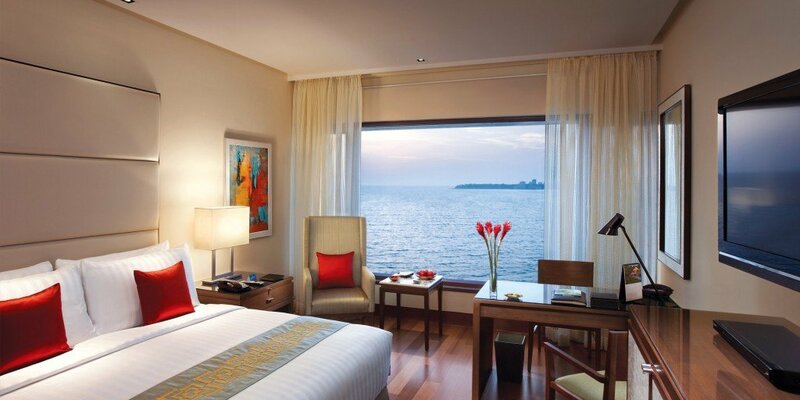 Situated on one end of Mumbai’s famous Marine Drive, with magnificent views of the city and Arabian Sea, the Oberoi is one of the finest places to stay in this busy metropolis. The superbly equipped rooms, many with excellent sea view rooms, are modern and elegant. The hotel boasts superb facilities, including a rooftop swimming pool, and their signature world-class service. In the evenings, the bar overlooking the bay is a favourite with local jazz aficionados. If you’d like to include a stay in Mumbai on your upcoming trip to India, please do get in touch. We specialise in private, luxury tours of India, and would be delighted to assist with the planning of your arrangements. All our tours are tailor-made, and we encourage you to ask for any number of adjustments until we’ve crafted your ideal experience. The Oberoi's presented us with an award!